The 2018 North Texas Soccer Fun fest combines all of the joys of playing in a soccer tournament with the exuberance of a carnival atmosphere. 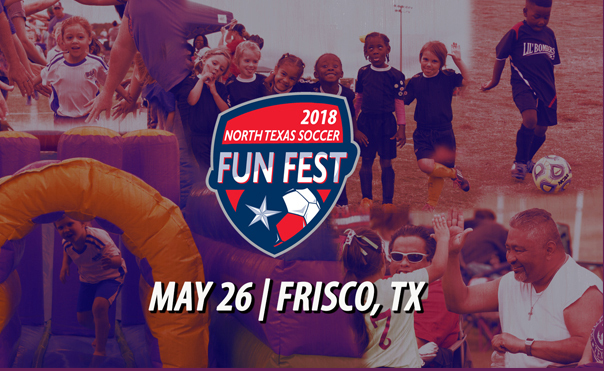 Fun Fest is available for all recreational teams in North Texas Soccer in the 5-Under through 8-Under boys girls age groups on May 26 at Warren Sports Complex in Frisco, Texas. Each team is guaranteed three games with plenty of time in between to enjoy some of the other forms of entertainment, which include face painting and inflatable bounce-houses. Last season, teams in the same age groups played at Michael Skinner Sports Complex in Mansfield, Texas. Recreational players and their families will get the opportunity to experience another weekend of soccer packed with teamwork, activities and most of all, fun. In addition to the multiple avenues of fun readily available, each player will receive a trophy at the end of the tournament.